HomeSarah Yip NewsAugust News – Happy Eclipse, Father’s Day Tarot Offer, The Gift of Depression & New 11:11 Tips! It’s been a huge August, or Universal 18/9 Month of Conclusions. 18/9 is the vibration of words like LOVE and EGO. Add in the New Moon Solar Eclipse today (sudden re-balancing) plus Mercury Retrograde (time to release energy vampires) and that’s why we’re feeling edgy. The Cosmos wants us to clear our minds and rest before September, a Universal 1 Month of Action and Beginnings in a Universal 1 Year. This is no time to be tired before the party! If you’ve been craving more balance, your time has come. See Find Your Personal Year for your annual theme and lucky months, I’ve just updated this post. –Why Do I See 11:11 When I’m Not a Master 11/22/33? Even if you are an 11/22/33, this post is super relevant. hearts in bloom – they’re also very patient. How depression can mark the birth of a healer, coughs reflect being force-fed, food allergies can be a revolt against commercialism, and healing tips for addictions and unwell kids. 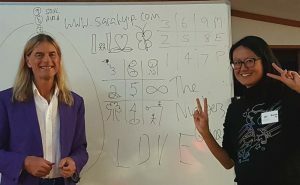 Beginners Numerology and Beginners Palmistry workshops will resume in 2018. Good News! Kris is taking over Tarot and numerology readings while I’m on maternity leave. He’s had rave reviews already. See 10 Things You Didn’t Know About Kris for a peek at our 11:11 Soulmate relationship. A Master 11 client said, ‘that was the best reading I’ve ever had’. Call Kris on 0428 626 727 to book ($150/ hour). He’s also on facebook and online. Vicki Haspels – Psychic mentor, medium and Reiki- read more. Heather Plett – Writing coach – she’s a 29/11 too – see facebook and her post on holding space, it’s had 3 mill. views! Andy Henderson – WordPress expert – he helped me escape Vistaprint forever! Even Buddhas Get the Blues I finally blogged about my Dad leaving home, in keeping with the global need to ‘reparent ourselves’ in this 1 Year of Root Chakra healing. Both Tanishka’s article and the ABFE White Light Essences* helped me to let go. *I will review these essences – that’s me (briefly) teaching numerology with Ian White in the top photo. Sweet Honey in the Rock’s Eye on the Prize (3min 36 sec – more 33s). This Civil Rights anthem is so relevant with what’s going on in the U.S. On that note, I felt moved to post on Justine Damond, the Aussie life coach shot dead by police. She had a Master 11 name AND address. Her death has sparked huge debate. R.I.P. fellow Messenger. Kris is offering 10 x one hour vouchers for Dads looking for direction and moral support. Email Kris or call 0428 626 727. For $150, your Dad gets a reading AND a free pair of socks! Sweet! Psychic readings, including numerology, palmistry, Tarot, 11:11 tips and clairvoyance. See 99+ testimonials, FAQs and media. Visit Bookings to join my waitlist. A reading near your birthday is best, as that’s when you change Personal Years in numerology. Need help sooner? Call Kris on 0428 626 727 or Vicki on 0421 649 841 for a reading. P.S. 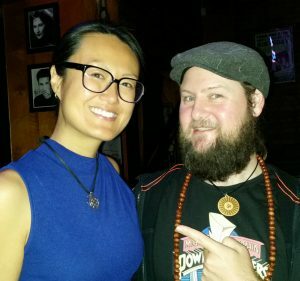 I’ve been featured on Mamamia, talking about crazy psychics.